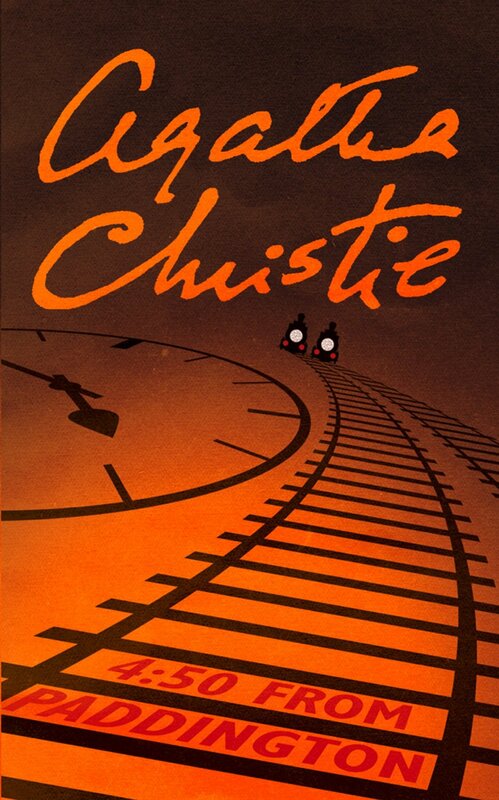 In this Miss Marple mystery, our story starts, not with Miss Marple, but with another elderly lady, Mrs. McGillicuddy. After doing some Christmas shopping in London, Mrs. McGillicuddy boards the 4.50 from Paddington, heading to the country to visit an old friend. On the way, another train momentarily runs parallel to Mrs. McGillicuddy’s. In that brief moment, the blind in the carriage of the other train flies up and Mrs. McGillicuddy sees a murder being committed. Although she reports this when her train arrives at the station, no one really takes her seriously, especially since no body is discovered. Luckily, the old friend Mrs. McGillicuddy is stopping to see happens to be none other than our intrepid Miss Marple, who takes her friend very seriously indeed. Unable to do the legwork herself, Miss Marple calls upon a younger friend, Lucy. Together, with Lucy finding the clues and Miss Marple piecing them together, both body and murderer are, of course, found. While a good mystery, this one seemed to lack a lot of what one might call “Miss Marpleisms” – where she draws completely baffling parallels between players in the current story and people back in her home village. While we do get a few of these conversations, the bulk of the action is taking place with Lucy and her conversations instead. I missed the fluttery Miss Marple comparisons, and attempting to figure out what she’s saying (which is often more of a mystery than the mystery itself!). “And yet – there was quite a lot of money, wasn’t there? You’d think it would be enough shared out…” She paused, the words tailing off. I appreciate the way that Christie doesn’t beat around the bush with her concept of what makes people do bad things. In Christie’s narratives, people don’t do bad things because “society didn’t train them right” or because they “lacked a supportive family” or any of the other weak social excuses that seem to be handed to every criminal out there these days. In Christie’s book, people do bad things because their own greedy desires lead them to do bad things, and they lack the moral character to stand against those selfish impulses. In Miss Marple’s book, and by everything I can read, in Christie’s as well, there is no room for the currently-favored “insanity” plea. People who have done terrible things have done them whether they were crazy or not, and, as Christie frequently tells us, bad things cannot go unpunished. And whether you agree or not with her conclusion, you must admit that it is one worth of contemplation. This entry was posted in Book Review, Fiction, Mystery and tagged 4.50 from Paddington, Agatha Christie, Miss Marple, mystery, What Mrs. McGillicuddy Saw. Bookmark the permalink. True, and even beyond being unafraid to have legitimate “bad” and “good” people, writers like Christie are unafraid to label certain actions as being intrinsically good or bad. In Christie’s writing, murder is always bad. It doesn’t matter who did it or what their justifications were or how deserving the victim was (although there are instances, most famously ‘Murder on the Orient Express’, where those questions are wrestled with at depth), murder is bad. There is a fantastic conversation between Poirot and the murderer in ‘The Patriotic Murders’ (‘One, Two, Buckle My Shoe’), wherein the murderer explains that the people killed were, basically, unimportant in comparison to the murderer himself, who is an important person in the world. And Poirot says that the lives of those four victims are just as important as the life of this one important man. In an era where morals, and, indeed, the “right” to kill those who are inconvenient (thus far, only if they are in the womb, just out of it, or quite elderly/sick, but it’s a slippery slope), Christie’s strong line on the value of life, all life, is refreshing to me. Have you ever read Christie’s autobiography? Like all autobiographies, I’m sure a lot of it is through rose-colored spectacles, but her writing is just delightful, and, after reading it, I see so much more of Christie herself in various of her characters.